This post is Part 3 of a 4-part saga. To start at Part 1, please enjoy: AppleCare Needs a Frequent Flyer Program. As the saga progressed on my 2013 MacBook Pro being unable to contact any Apple services (no apps would run, no Mail would come in, no access to my iCloud data), I decided to see if I could get a response out of the executives at Apple. 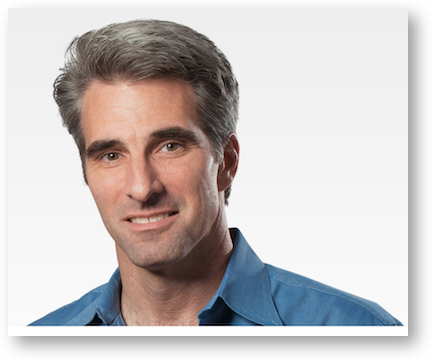 I originally wrote to Tim Cook, CEO of Apple but then forwarded the email on to Craig Federighi, Senior Vice President of Software Engineering. He seems like a swell guy with that pretty hair and all. I didn’t bother you when all 4 of my family’s iPhone 6/6s phones had their batteries fail. I didn’t bother you when my 12″ MacBook died after 5 months. I didn’t bother you when my first 2 sets of AirPods failed. I didn’t bother you when it took 3 replacement 12.9″ iPad Pros before I got one that worked. I didn’t bother you this week when my 7-month old 15″ Touch Bar MacBook Pro died. But I’m bothering you now as a result of this latest failure. When you look at all of these failures piled up together, it’s a pretty impressive list, isn’t it? I’m not just a whiner about hardware failures, the magnitude is real. Anyway, imagine my delight when the next day, my new friend Erica Gawley from Craig’s office gave me a call. She’s in what’s called Executive Relations (the cool kids call it ER). I think my favorite thing about Erica is that she hasn’t once expressed sympathy to me about this. I didn’t mention it earlier but I spoke to Customer Relations and that was all the guy would do for me, tell me how sorry he was that this was happening. Cut that out and DO something, man! Erica isn’t technical but she’s in charge of making sure I am made whole. She read through my case, and someone somewhere was allowed to talk to Engineering and give her back some information. Remember how Senior Advisor Guin had told me that my Mac was blocked and that only Engineering could flip the switch to put it back? Well, Erica said that engineering is saying that it isn’t blocked and that they don’t actually know why it’s not working. I’m not sure if that’s better or worse! Erica explained that engineering has more questions to be answered, and so yet another Senior Advisor, this time of the Specialist variety, was going to call me at 2pm. Before I let her off the phone, I asked her to do one more thing. I asked her if she knew who Sal Soghoian is, and explained that I’d really like to not be doing shadow puppets at Sal’s Command-D conference next week. The one other thing she could do was to contact Apple’s repair depot and see if she could get them to put the repair of my 2016 MacBook Pro to the top of the queue. At 2pm Joe Gannon called me. I asked him what “Specialist” at the end of Senior Advisor meant. He said that it’s a more tenured version of the folks that you get on the phone, who are plain old Senior Advisors. He sent me a link to download an analytics application that would scan my system while I replicated the problem. I’ve seen this before and I was disappointed that Guin hadn’t thought to run this 2 days earlier. And now again, we wait for Engineering to find some wisdom in those log files. Later in the afternoon, Erica called me again to tell me that my repair was complete, and that my Mac would be shipped out that night and should arrive the next day shipped to my local Apple Store. Finally some good news! Technically that’s in the 3-5 days they quoted, but I had a feeling that 3 days wouldn’t ever happen. I have a better feeling about this since Erica is pushing from her side. She’s modest that she can’t promise anything but I’ve worked in a big corporation and when you get a call from someone representing an executive, it’s all hands on deck. Even when the request is absurd, people run around like crazy doing whatever they can to get the action off of their plate and onto someone else’s. That’s where I leave this story right now, stay tuned for more developments. Hmm, a ploy by Apple to make sure everyone spends an extra +$100 for AppleCare for every device? Sounds like you have contracted the dreaded “Chuck Joiner Malware” :):):) Hope they finally fix it. Please post what they replaced. There’s a structural reason built into Apple’s business plan that is the source of these issues. Naturally he was eviscerated by his own fanbase, and apologized the very next day. You absolutely made my day today George Conant!